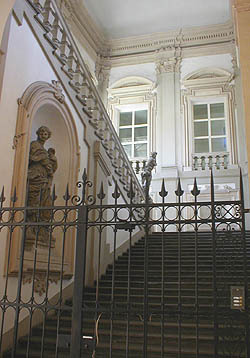 This palace is located at Via San Vitale 23. 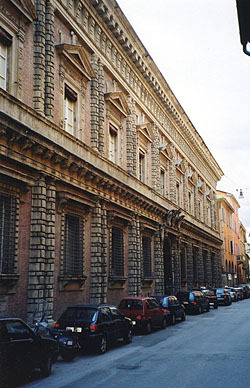 It has been described as "the most singular and anticonformist of the great patrician residences of the Renaissance in Bologna". 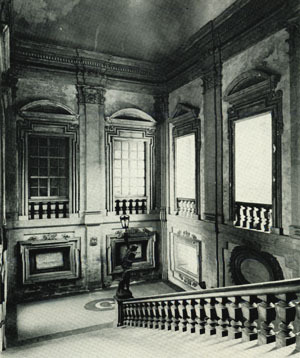 1 Until the end of the eighteenth century the palace was the residence of the Fantuzzi family. 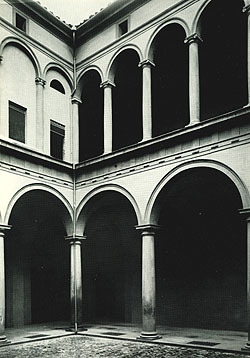 1 Giancarlo Roversi, Palazzi e Case Nobili del '500 a Bologna: La Storia, le Famiglie, le Opere d'Arte (Bologna: Grafis, 1986), 83: "la più singolare e anticonformista fra le grandi residenze patrizie della Rinascenza a Bologna". 2 Cf. Roversi, 95; Maurizio Ascari, James III in Bologna: An Illustrated Story. Royal Stuart Papers. (London: Royal Stuart Society, 2001), 31-32. 3 Frank McLynn, Charles Edward Stuart: A Tragedy in Many Acts (London: Routledge, 1988), 28-30. Image 2 (Scalone): Giancarlo Roversi, Palazzi e Case Nobili del '1500 a Bologna: La Storia, le Famiglie, le Opere d'Arte (Bologna: Grafis, 1986), 90. Image 3 (Scalone): © Noel S. McFerran 2006. Image 4 (Cortile): Roversi, 97. 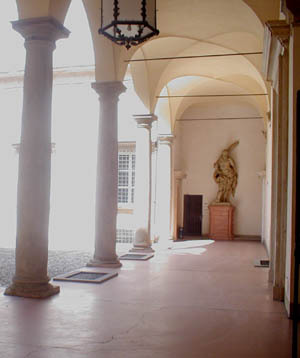 Image 5 (Cortile): © Noel S. McFerran 2006. This page is maintained by Noel S. McFerran (noel.mcferran@rogers.com) and was last updated May 5, 2007. © Noel S. McFerran 2000-2007.